Green tea blends are a popular and stylish drink of choice for health conscious individuals. But is green tea beneficial when you have a thyroid disorder? An article published in 2010 in the Human and Experimental Toxicology journal was the first to raise questions about the possible anti-thyroid effects of green tea. The researchers reported a significant decrease in T3 and T4 thyroid hormone concentrations when rats where given high doses of green tea. They also reported a significant rise in TSH in response to a drop in thyroid hormone levels. There have been further studies into the possible harmful effects of high dose green tea on the thyroid. But to date these have all been conducted on animals. It will be good to see human studies released in the future to reveal if green tea is truly harmful to the thyroid. Feeding laboratory rats high amounts of green tea extract does not reflect what is happening in the real world. This brings to light an important issue when investigating published research. No matter what health topic you are researching, human studies are superior to those carried out with animals. The best studies are done using a large cross section of the general population. Despite the limitations with the current research into how green tea affects the thyroid you may want to read more before you brew up your next cup. If you have a problem with your thyroid this popular beverage may be less than ideal. Green Tea Side Effects on Thyroid #1 The quality varies according to where the tea is grown and how it is harvested. If you drink green tea select a certified organic product that clearly displays the organic certification logo on the label. Choosing an organic product will minimise your exposure to pesticides which are known to harm the thyroid. Also check the country of origin if possible. Most of the world’s green tea is from China. Green tea is known to accumulate an array of toxins from the soil and water. It is well worth seeking out a product that is grown and harvested in an area free of industrial pollution. Green Tea Side Effects on Thyroid 2# Green tea can contain unacceptable levels of fluoride. The tea bush readily absorbs fluoride thorough its root system. If you brew green tea using unfiltered water you will further increase your intake of fluoride as most urban water supplies contain this toxic chemical. As you probably already know, fluoride blocks iodine absorption. The thyroid uses iodine to produce the thyroid hormones making this an essential nutrient for ongoing thyroid activity. Fluoride also has potent negative effects on the structure and strength of your bones. Green Tea Side Effects on Thyroid #3 Green tea may be too ‘cooling’ when you have hypothyroidism. According to Traditional Chinese Medicine (TCM) all foods and drinks have certain qualities that govern how they affect the body. Green tea is considered ‘cooling’ and is indicated to clear heat from the body. As hypothyroidism is a ‘cold’ condition a beverage that further cools the body may be less than ideal. To counter the cooling effects of the green tea you could try adding freshly grated ginger to your tea infusion. Ginger is a warming remedy that aids circulation. Green Tea Side Effects on Thyroid #4 Tannins released naturally during steeping may reduce iron absorption. If you have low iron levels, or are prone to low iron stores the general advice is to drink green tea at least two hours away from meals. Over-steeping green tea will release greater amounts of tannins. Tannins make the tea taste bitter and will cause a drying effect in the mouth. 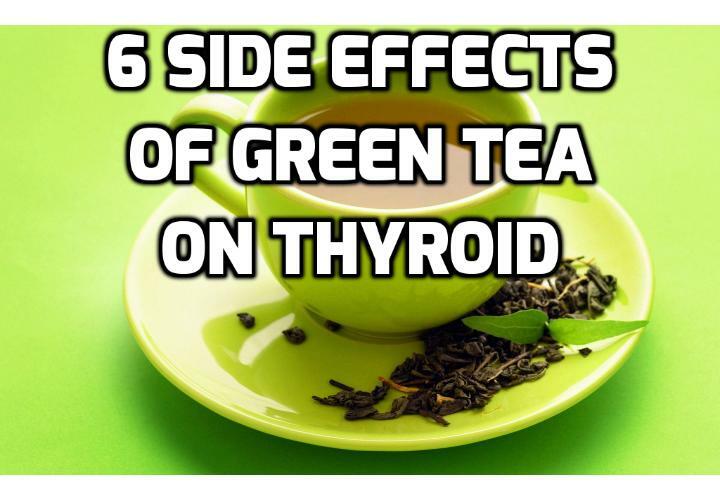 Green Tea Side Effects on Thyroid #5 Green tea naturally contains caffeine. Although green tea contains less caffeine than coffee, drinking green tea at night, or even later in the day may disturb restful sleep. For this reason it is best consumed in the morning. If you ever feel ‘jittery’ chances are you are drinking too much. Green Tea Side Effects on Thyroid #6 Caffeine acts as a diuretic and may also affect the normal rhythm of the heart. Individuals with serious heart conditions are therefore advised to avoid any type of beverage that contains caffeine. This includes nutritional products featuring green tea extracts containing caffeine. Skin Deep. Do Cosmetics Harm the Thyroid? What is the Best Way to Diagnose Hypothyroidism? Can Basal Temperature Testing Help Diagnosis A Thyroid Problem? Should You Get a T3 Test If You Find It Hard to Lose Weight? Why Knowing How to Calculate Your Reverse T3 Ratio Helps to Assess Overall Thyroid Health? How to Lose Weight with an Underactive Thyroid? Next PostNext Why Soy Foods Should Be Avoided if You Have Thyroid Disorder?